For over four decades, legendary artist Alice Cooper has been a cutting-edge figure in rock & roll, with his uniquely theatrical brand of hard rock. He was a pioneer in hard rock and glam rock, and he’s influenced many other bands including KISS, Metallica, Rob Zombie and Marilyn Manson. Notably, he was inducted into the Rock & Roll Hall of Fame in 2011. Recently, Cooper has been recognized for his songwriting ability—he has been nominated for possible induction into the Songwriters Hall of Fame. Cooper would certainly be a worthy addition to the Hall of Fame. 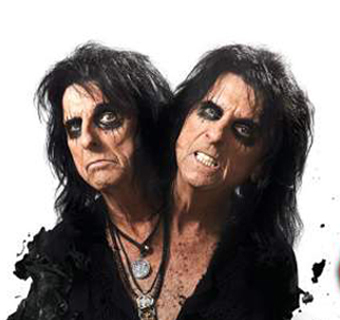 We are pleased to do this new Q&A interview with Alice Cooper. He talks in-depth about his songwriting, and he tells how he wrote such classic songs as “School’s Out,” “I’m Eighteen” and “Only Women Bleed.” But before we get started, here are some highlights from Cooper’s hit discography. According to Wikipedia, Cooper has recorded and released 26 studio albums, 48 singles and 11 live albums. His first album, Pretties For You, was released in 1969, and his latest album, Paranormal, was released in July (2017). His best-selling albums are: Love It to Death, Killer (both from 1971); School’s Out (1972); Billion Dollar Babies, Muscle of Love (1973); Welcome to My Nightmare (1975); Alice Cooper Goes to Hell (1976); Trash (1989); and Hey Stoopid (1991). Cooper remains a strong live performer, and he tours steadily with his band. He is currently on tour in Europe, and he’ll return to North America this March for many shows in the U.S. and Canada. DK: You’ve recently been nominated for the Songwriters Hall of Fame. How does it feel to receive recognition for your songwriting? Alice Cooper: That’s very nice. I got a call from Desmond Child (hit songwriter who’s in the Songwriters Hall of Fame). He was very excited, telling me I was nominated, which is great. You know, being in the Rock & Roll Hall of Fame is great, because you spend all your life doing that, and then you keep forgetting that all of that is built on the songs you wrote (laughs). I mean, I learned how to write a song, like every other kid, listening to the Beatles. And I realized there were two guys who could tell a story in three minutes, and that’s Chuck Berry and Ray Davies from the Kinks. I would listen to Chuck Berry and he could tell a full story in three minutes. And I started figuring out how to do that. Chuck was an influence on songwriting for me, as a lyricist. at the Rock & Roll Hall of Fame ceremony in 2011. DK: When you wrote your classic songs in the ‘70s and ‘80s, what was your songwriting process? I noticed that some of your bandmates were also credited as co-writers. Cooper: I always liked the idea of writing a title first. If I came up with a title like “Only Women Bleed,” which was a very controversial-sounding title, except that I was trying to say that women bleed emotionally. You know, men are a little bit more…face value. But women are a lot tougher emotionally than men are. And so when I wrote this song, you always try to marry that lyric to the chords. [With co-writing], I do like playing with either a piano player or guitar player that will just sit right there with you until those two things match up. [When I wrote these ballads], I played a little game. I had two daughters and a wife, and I would know exactly where that lyric was going to break their heart. I would sit there and play the song for my two daughters and my wife. You know, I’d listen to it…here comes the chorus. And then at one point all three of them would [softly] go…”Ohhh…”(laughs). When that happens, you know you got it. The girls get the fact, and say, “Ohhh…that was the one moment that just broke my heart.” And then when you got that, you know you have a hit. DK: One of the first hits you wrote was the teen anthem, “I’m Eighteen.” What inspired you to write this song? Cooper: Well, it was during or right after the Vietnam War. I wasn’t trying to write an anti-war song. But here I was—I was 1-A (U.S. draft classification), and I was in line to go to war. I was around 18 at the time. Now, I wasn’t anti-war…none of the guys in the band were. We were sort of All-American kids. But, it was ironic that you could go to war, and yet you couldn’t vote (the voting age was 21 in the ‘60s). You could go to war but you couldn’t buy a beer. And it felt a little lopsided, how you were going to go risk your life for your country, but you couldn’t vote on it. At the same time, I thought every kid goes through this…”I’m not a boy, I’m not a man, I’m in the middle. I’m frustrated…I’m sexually frustrated, and mentally frustrated. And you think that he’s gonna say, “I’m 18 and I hate it.” But you know, I want him to say, “I’m 18 and I like it.” That was the hook for the song, “I’m 18 and I like it…I like being frustrated. I like being in this sense of confusion, in this position.” So that was the hook to the song, “I’m 18 and I like it…I’m 18 and I love it.” And I think that’s what turned that song around. Here’s a video of Alice Cooper performing his hit “I’m Eighteen” in 1990. DK: My favorite song of yours is the anthem, “School’s Out.” Can you talk about how you wrote this song? Cooper: Well, when I heard “My Generation” by The Who, I thought…Okay, this is an anthem, because every kid is going to relate to that song. You know the lyrics, “I hope I die before I get old…People try to put us down, just because we get around.” And I went…Wow, that’s a really cool song. The other anthem like that was “I Get Around” by the Beach Boys. And I thought, what is the common denominator for every teenager? For me, it was the last three minutes of the last day of school. When you’re sitting there, and you’re watching that clock tick down on the last day of school, and in those last three minutes, there’s the anxiety…When that bell rings, you’re done for three months. You’re free. You’re gonna have so much fun! And I said, “If we can capture that last three minutes on tape, that’s gonna be a hit.” And that was the whole idea, you know School’s Out, and then the bell rings, and then the kids’ screaming and yelling and cheering. So that was the idea—we really did capture that last three minutes of the last day of school. DK: Thank you for telling this story. Besides these songs we’ve discussed, do you have another song you’ve written which is a personal favorite, that means a lot to you? Cooper: There’s a song I wrote with Desmond Child and Bob Ezrin, and it’s called “I Am Made Of You.” It was on the Welcome 2 My Nightmare album (from 2011), and it was the first song on the album. Now, it was really interesting how this song lyrically came about, because when you listen to the song, it can be taken three different ways. Our producer Bob Ezrin said, “You’re singing to the audience, I am made of you.” And that was saying, ”I’m one of you and we’re connected.” Then Desmond Child said, “No, it’s I am made of you…the guy is singing to his girl, I am made of you…we are one. And I said, “Yes, but it could also be a hymn. It could also be a guy singing to God…I am made of you. If you listen to the lyrics through the whole song, I’ve actually heard that choirs and churches do this song now. And I’ve also heard that people do it as a boy-girl song. So it can be taken in a bunch of different ways—it really did act as three different songs in one. DK: Thank you Alice for doing this interview. Is there anything else that you’d like to mention for this article? Cooper: You know, songwriting to me is the most fun part of doing it, because I would sit down and watch TV, and somebody will say something and I’ll write it down. And I’ll say, “that’s potentially a song right there.” Somebody will just say something that doesn’t make any sense at all, but it sounds like a great hook for a song. So every good writer I know [would try to find hooks], and (hit singer/songwriter) Harry Nilsson used to do this too. Harry and I would sit there and we’d compare notes—we would have little notebooks of just song titles (laughs). And I think most songwriters do that. You know, they hear a little phrase and they immediately say, “Oh man, later on that’s gonna be a great song.” So it’s funny how those things collect in your mind. You have to think like a songwriter every day. You may be watching the dumbest Chinese Kung Fu movie, and something is said out of context, but somehow it makes sense. It could be a good song (laughs).